The EVOLV Industrial HTHW Series boiler is ideal for high temperature hot water applications with available designs up to 500 F maximum allowable working temperature (MAWT) and 800 psig maximum allowable working pressure (MAWP). With its’ innovative pressure vessel and tube configuration, system designs incorporating temperature differentials of up to 150 F across the boiler may be used without potential for damaging the boiler through thermal expansion and contraction. The boiler carries a standard 25 year pressure vessel warranty covering high temperature differential operation. In addition, the boiler may also be kept in a cold standby mode and when required to produce heat, the unit may be brought up to full firing capacity without suffering from the effects of thermal shock. With a cold start, and considering the relatively low water content of the vessel, the unit is capable of being up to required system temperature within 12 minutes. Further, this operating capability translates directly into fuel cost savings by greatly reducing standby heat losses associated with maintaining a boiler in a warm or hot standby mode. Coupling this design feature with the fact that the boiler has the highest steady state operating efficiency of any water tube boiler on the market today, annual fuel cost savings that will be realized when using the EVOLV Industrial boiler for high temperature hot water applications are truly significant. Additional system and installation savings may realized when considering high differential temperature systems have corresponding low water flow rates, thus reducing pumping requirements and distribution pipe sizes. 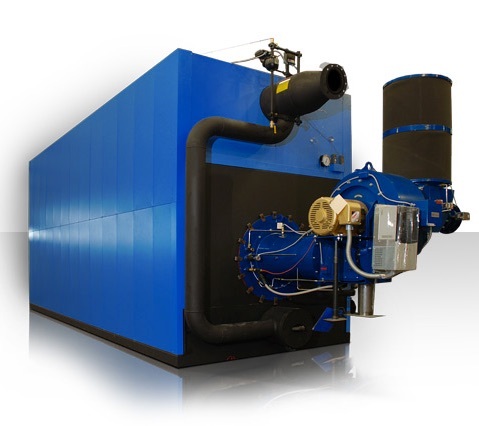 Given the inherent design features provided by the EVOLV Industrial HTHW Series boiler, increased boiler and system efficiencies are realized while simultaneously allowing for reduced system material, equipment and installation costs. EVOLV Industrial Series HTHW, your high temperature hot water application solution.